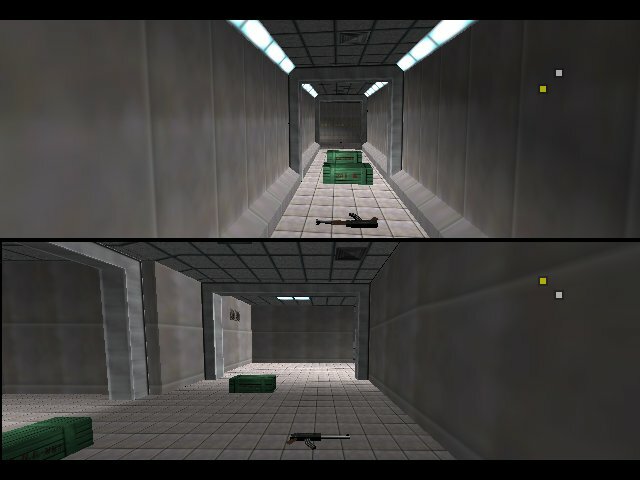 A completely new and unique GoldenEye level, testing ramps and allowing for very close knit combat. 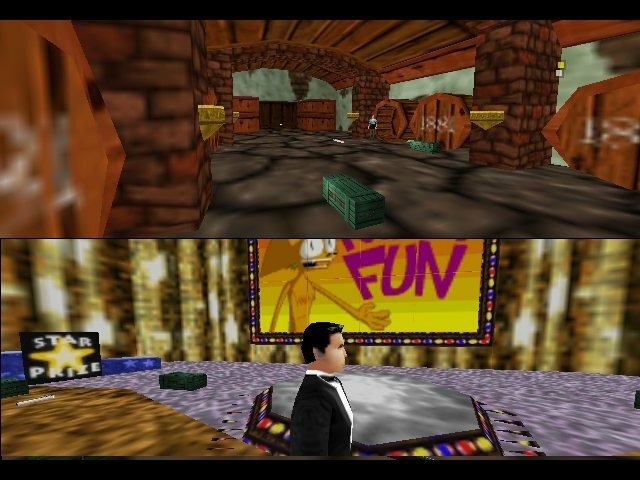 It contains Banjo-Kazooie textures, but only one room. 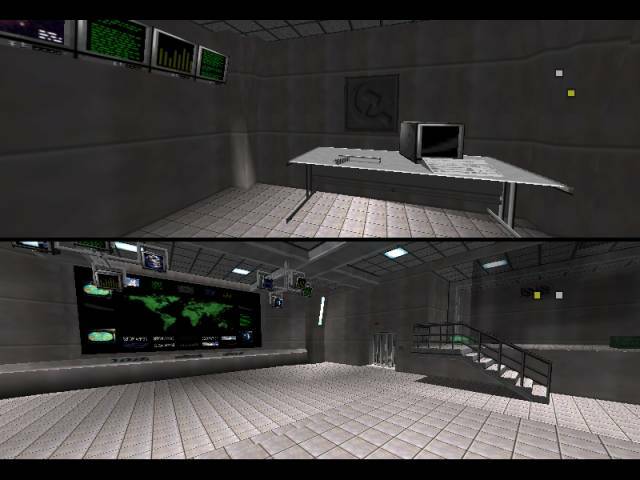 The level and texturing was all made by Cyberen, and the port to GE was by SubDrag. Decreased -ma memory for background data to load console. Removed collisions flag from weapons. Removed extra portals from background file. Deleted excess data leftover from previous background file. Relinked clipping and object pads. Added starting weapon as unarmed. Added arm type as Jungle (bare skin). Access to Archives multi on new file. Renamed Archives multi as Almond Temple. Now uses random music track instead of Archives theme. A rework of Antenna Cradle with new props and obstacles. Archives full zone level (entire map) in multi. Hello everyone, A request from fellow members of the group chat. Has ask me to make a level for them. Due to my spare time, I decided to make the archives first floor only map. This map has only one floor design. 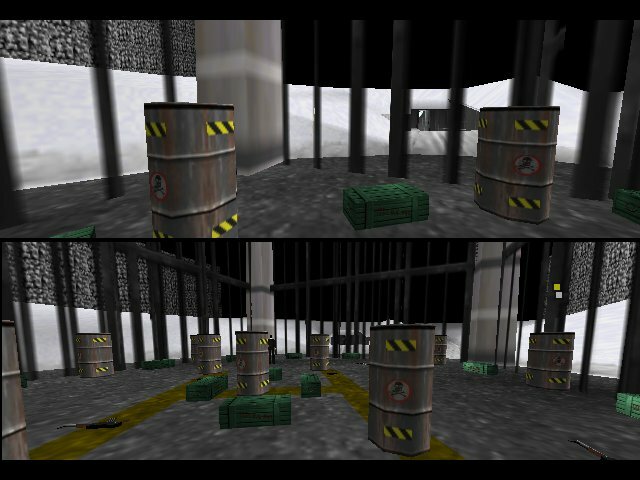 Use mostly single player object set, but with barrel as a twist, along with extra boxes and some added objects to the outside part of the map. As a reminder, this map can be played in four player mode. But keep in mind, the framerate will drop horribly. Another PD port folks! This level was initially designed for 2 players, but it should hold up for 3 players (4 might be pushing it!) It is a fairly small map, so this will be guaranteed to keep players on their toes at all times! This version is 1.0. The update will feature a view of a planet from the bridge window. If you find any bugs, please send me a PM so that I can adjust the map accordingly. I would like to give special thanks to bmw for advice on modifying BG files, and Wreck and SubDrag for the BG file itself and helping me to attempt to get the planet showing. Roll on version 1.1! 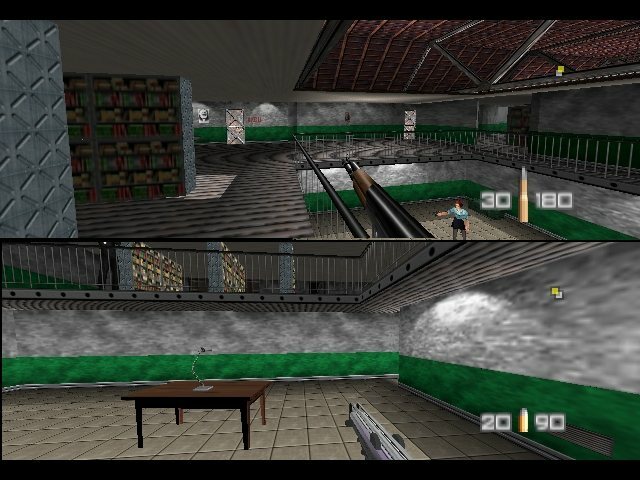 This level replaces Archives in Multiplayer. Hope you all like it! 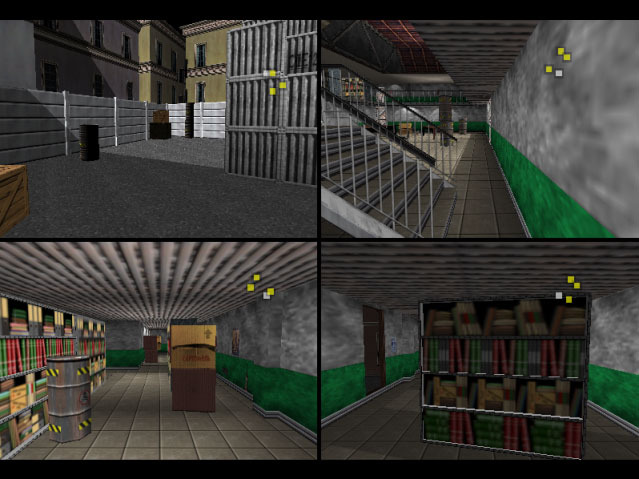 The BK Map Pack, with three Banjo Kazooie levels in GoldenEye (with minor twists). Furnace Fun, Grunty's Tower, and MMM Cellar. A new level, nearing a real fun playable level! 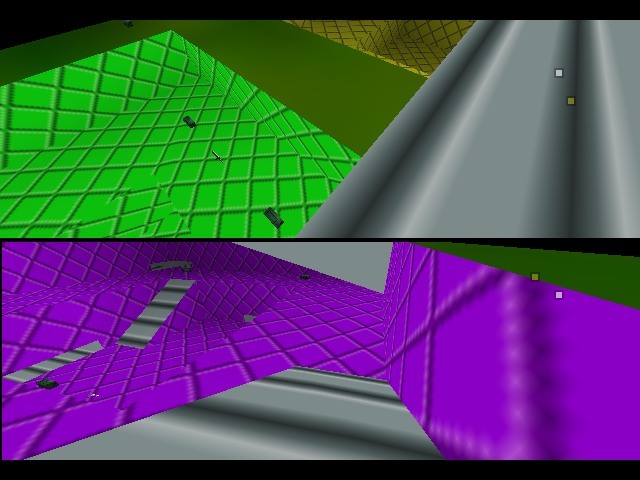 This is modelled after Mario Kart 64's level. Play Archives multi to play it. It's still composed of just one room, multi-room has been tricking on assigning clipping rooms to rooms, and visibility is off. Level and floorplan by Cyberen, conversion by SubDrag. Decreased -ma background memory to load on console. Removed collisions flag from all pickups. Removed in air flag from armour. Moved flag tag pickup order after weapons and ammo. Changed default arm to Jungle (bare skin). Deleted excess BG data leftover from previous file. Made grass texture use dirt hit types. A new level, nearing a real fun playable level! 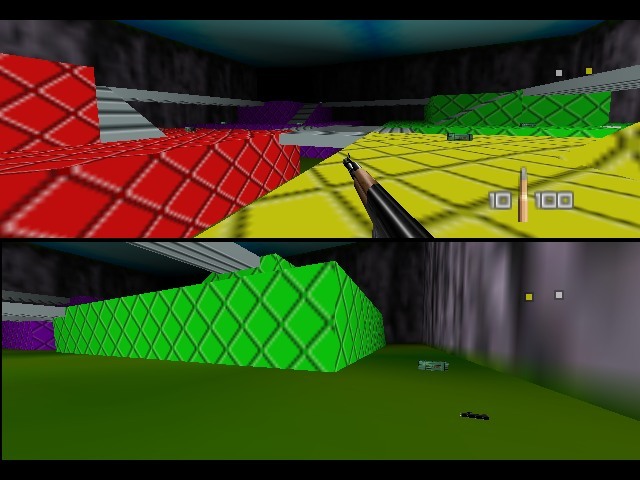 This is modelled after Mario Kart 64's level. Play Archives multi to play it. It's still composed of just one room, multi-room has been tricking on assigning clipping rooms to rooms, and visibility is off. Level and floorplan by Cyberen, conversion by SubDrag. Upside-down. Removed collisions flag from all weapons. Changed one Golden Gun ID into a missing pickup ID. Included arm type as Jungle (bare skin). I've decided to release my levels one update at a time - each new level, as completed, will be added to the multiplayer menu of the same rom and released as a new ips patch. If you encounter any bugs, either in the stage or in the weapon sets, please LET ME KNOW! Its nearly impossible to thoroughly test everything on my own. 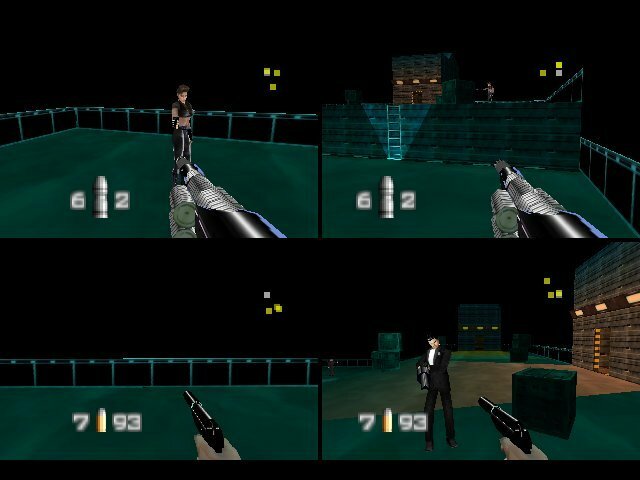 Applying the ips patch is easy if you use the goldeneye setup editor. Also keep in mind that since this patch includes modifications to the 21990 table, you will have to modify your emulator's advanced settings to match those of the original rom. Apply the ips patch and load facility from the level select menu. I'm fairly sure I've worked out all the clipping and bg bugs, but if you find any, post them here. This level will eventually be part of a 12-level multiplayer pack (which I'm kind of writing from scratch). There have been numerous background changes, designed to both improve framerate and to add a few travel routes. Also imported part of the runway and connected it to the back of the bottling room. 4-player is still, IMO, too chopopy to play. But 2-player and 3-player play very well. Confirmed framerate improvement over the original map I released several years ago is 20 percent (12 percent from bg mods, 8 percent more from a more lean setup file). Removed extra null portals from background (crashed console). Deleted special visibility commands leftover from Facility. Prevented walking through wall near old lab hallway. Added fall to ground flag on weapons. Removed collisions flag on armour. Changed armour model to match strength. Edited certain door flags and paired sounds. Turned lab glass into tinted type. Changed arm type to Jungle (bare skin). Renamed level as Bottling Room. All levels available on new file. All character unlocked on new file. GameShark Codes Required for Console: 9 lines. The following codes must be activated in order for the stage to load. They modify the multiplayer level select menu, changing the Random slot into Bunker i. 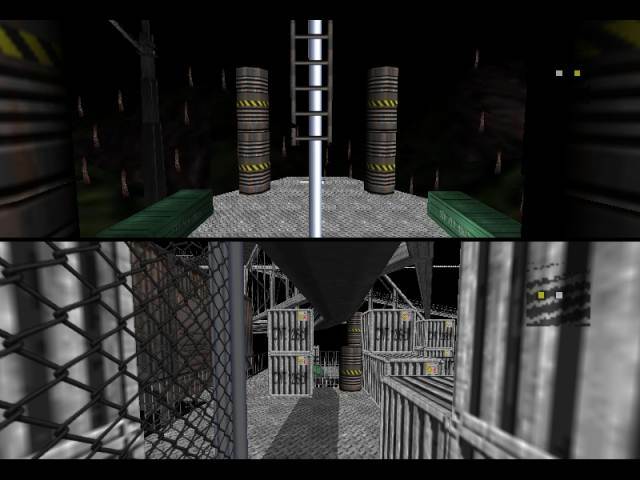 Other codes deactivate the weather in the stage, which once belonged to another multiplayer map. Be sure to have these codes turned ON before starting the game. 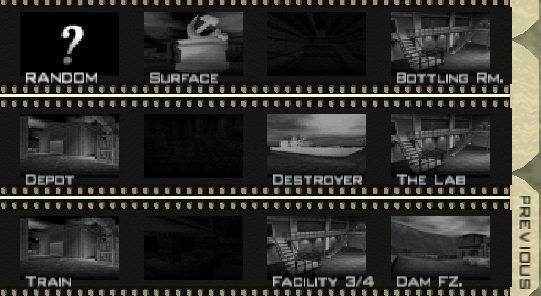 Comments: Select the Bunker i from the multiplayer level select menu and customize your options as you like. It'll only take a few short seconds to start up. There are six respawn points, six weapon sets, two body armours and the Flag Tag Token. Also included are all of the doors, monitors, a few metal crates and the glass pane. Framerate here is pretty strong, even with all 4-Players playing at once. The only times you may notice a drop in frames, is either when three or more players are in tight quarters, or when there is a full-on fire-fight in the main viewing room. You can expect the same results from this map as you are used to in Bunker ii. There are no blackouts in this level, but you may notice a place or two where it will flicker the odd time. The stairwell to the main viewing room and the helipad entrance walkway are the two most common. These visual problems last only long enough for you to barely catch a glimpse of and will disappear before you even realize it. A graphical error may occur while playing this stage. 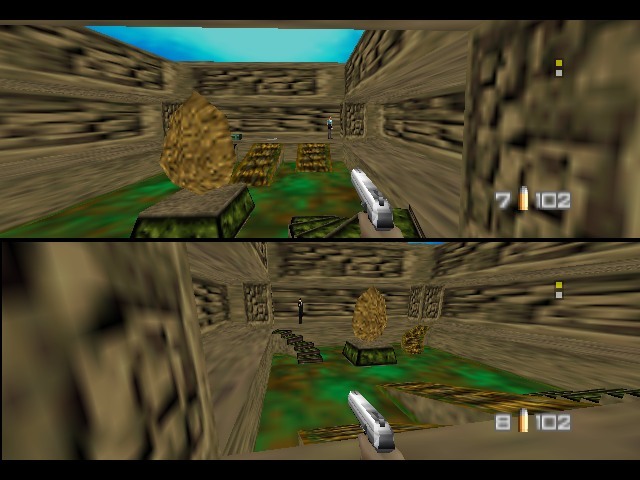 If two or more of the players die in such a way that each one has blood running down their screens at the same time, the level may temporarily experience an explosive rendering error. Sometimes this will even happen if only two of the characters are slightly injured. This will most likely occur in battles involving any type of explosive weapon. Once this happens, you will notice a change in any further flame and smoke produced by rockets, grenades, mines, freshly destroyed monitors, and even bullet holes. The flame will flicker in and out, while the intitial smoke will be a thick white, appearing in a vent grate like image, randomly flashing in different locations. The after effect smoke will also have a squared look to it, rather than circular. This rendering error will continue to persist as long as the level is being played. Although this does not hinder actual gameplay, it can be an annoyance. Simply exit and re-enter to resolve this problem. A simple mod of Bunker 2 Multi, where a few areas are blocked off, making the course smaller.Features: Objects from Solo have been added. Also, applying the IPS Patch makes this level playable with 4 players and unlocks Bunker from the start.Tested on: Console, PJ64 1.6Enjoy! It's my first multi level called Caged Carnage. Apply this patch to change Archives into Car Park, a multiplayer stage from Perfect Dark. The patch is emulator and backup-device friendly. Sorry, still trying to cook up an uploaded GS version… Apply this to an *unbyteswapped* ROM - V64 users should byteswap the entire file after applying the patch. 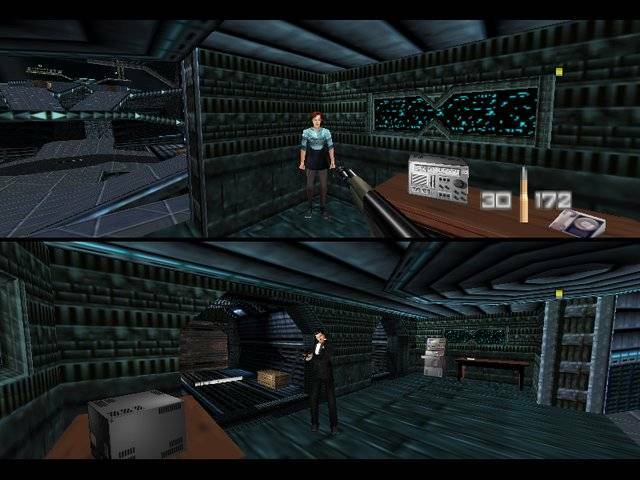 The stage is a direct port from Perfect Dark; many thanks to Wreck and SubDrag for converting the background file. 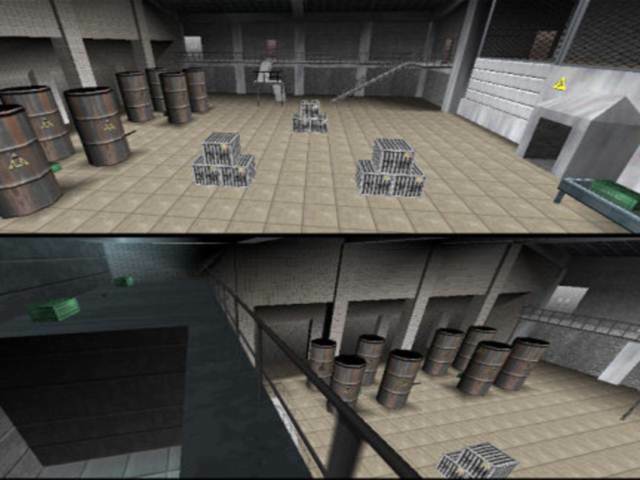 All twelve spawn points are retained, and all weapon locations are selected from the original - albeit the types of weapons and items collected differ slightly. 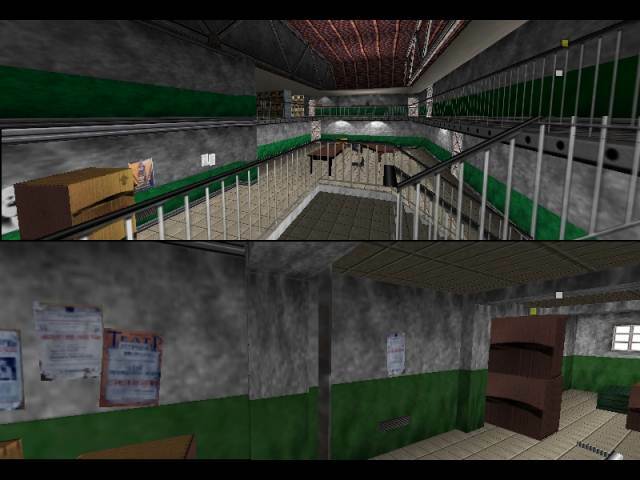 The stage scale has been tampered with though to allow players to run past each other in the stairwells and to properly implement falling from ledges. Players can fall off of the platform ledges in each room. There may be a small amount of resistance when doing so, though. Players can also climb onto the bottom half of each ramp from the side. The other has to do with ammo boxes. If a player shoots an ammo box off of a ledge but not far enough to register on the floor it will only be collectable if a player runs from the top of the ledge. You can also shoot the box and juggle it in the air, which usually will allow a player on the floor to collect it. The box has to be nearly along the wall to do this however, and you'd need a bit of time and ammo to do it anyway.